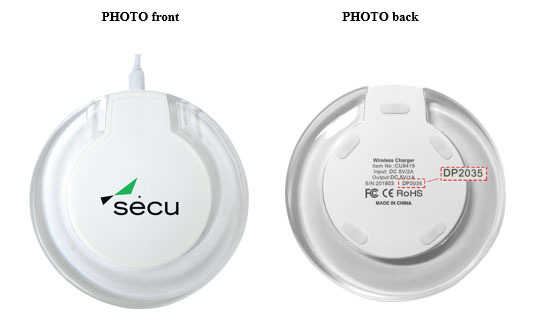 Through our longstanding commitment to product quality and social responsibility, Debco Bag Distributors Ltd is voluntarily recalling the Iris Wireless Charger known by the product SKU CU9419. We are collaborating with Health Canada on this recall. The affected colour is clear/white (only colour available) and would have been purchased by our distributors between February 9, 2018 and April 5, 2018 with the lot numbers DP1986 and DP2035. HAZARD: In rare instances, the charger will melt and/or smoke posing a burn hazard to consumers. We ask that you stop using and distributing the wireless charger and return to Debco for proper disposal. Debco will cover the cost of shipping. Health Canada requests that all distributors who sold this item within the affected time period contact their clients and inform them of this voluntary recall. Debco is happy to offer a full credit once the goods have been returned. The questionnaire attached to this communication must be completed before compensation can be issued. 1 (844) 730-5005 between the hours of 9:00am and 5:00pm (EST) Monday to Friday. You may also contact us by email at CU9419recall@debcobag.com. The supplier of this wireless charger is voluntarily recalling the Iris Wireless charger distributed at/by/ __________________________________. This recall is being conducted in cooperation with Health Canada. This recall involves the Iris Wireless charger in clear/white identified by product SKU CU9419. The charger may melt and/or emit smoke when overheated, posing a burn hazard to consumers. If you received one of these wireless chargers, we ask that you stop using it immediately and call the distributor at ____________________ so that they can work with you directly to provide you with details regarding this recall, and provide you with a resolution.